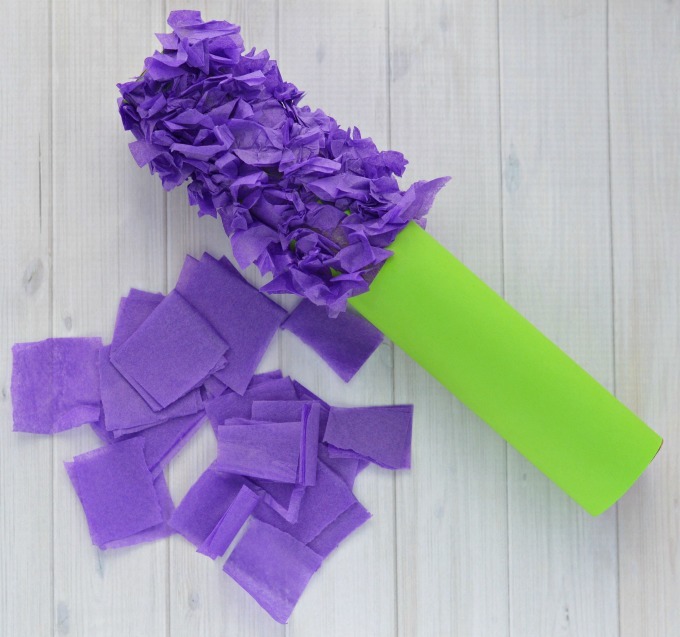 Transform paper towel rolls and tissue paper into a lovely hyacinth flower craft kids can make this spring. I always have great intentions in the fall of planting spring bulbs. I’ll see them at the store and make a mental note to make time to buy and plant them, except that never happens. One year I did order tulips from one of the school fundraisers and got those planted. Every spring, I kick myself for not getting more planted as I longingly admire everyone else’s spring flower. With spring arriving soon and bulbs starting to pop through the ground we were anxious to start making some spring flower crafts. We decided to start with hyacinths. Hyacinths are a beautiful spring flower with a wonderful fragrance. 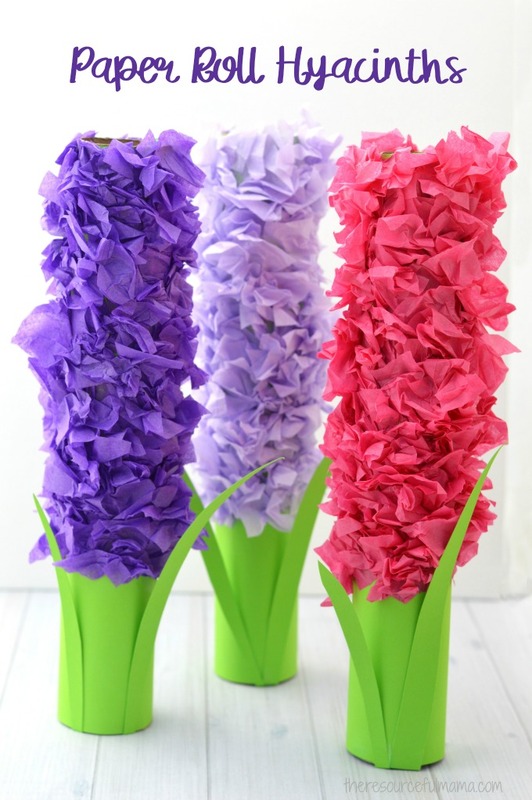 This hyacinth flower craft is a very inexpensive craft to make requiring only your recycled paper towel rolls, paper, and glue. 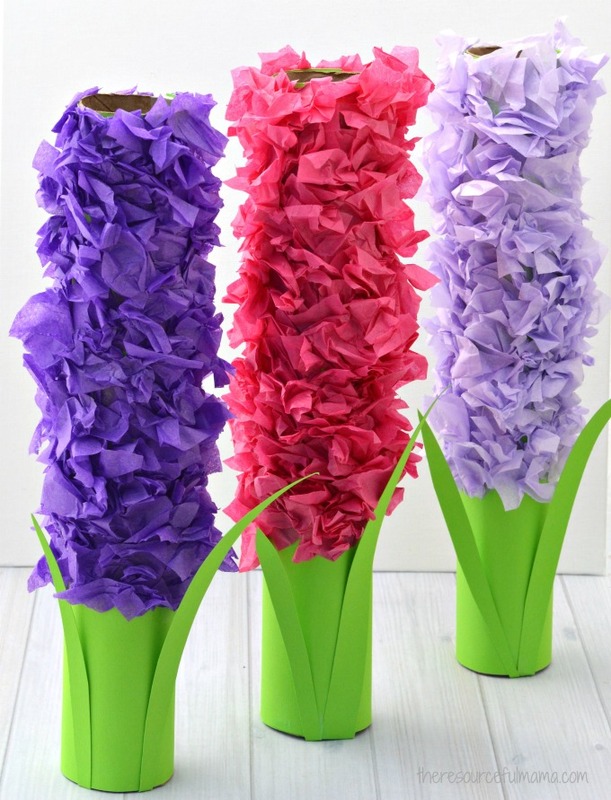 We used paper towel rolls to make our hyacinth flower craft. That’s a lot of surface to cover on a paper towel roll. 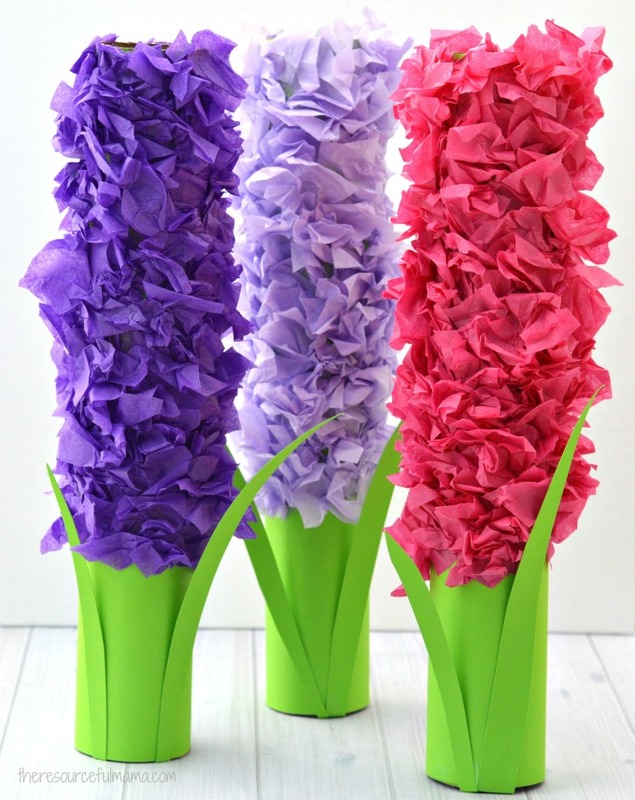 If you are doing this hyacinth flower craft with young kids, who may not have the attention span to complete the entire thing, you could cut your paper towel roll in half or use a toilet paper roll. 1. Glue or tape a piece of green paper to the length of a paper roll. Wrap the piece of green paper around the paper roll and attach again with tape or glue. You can trim off any excess paper and use it for leaves later. 2. Tear or cut tissue paper into smaller pieces. 3. 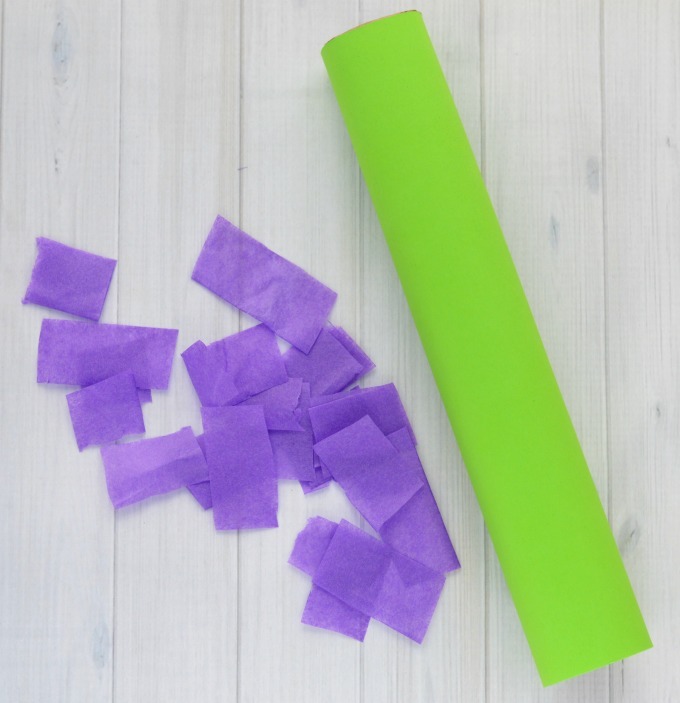 Crumble the tissue paper into smaller pieces and glue to the paper roll. We worked in sections by adding glue to a large area and then adding crumbled pieces of paper. Once that glue was covered, we moved to another area. We covered about 2/3 of the paper roll with tissue paper to make our flowers. 4. Cut two leaves from remaining green paper and glue to the bottom of each paper roll. We folded our leaves a little at the end and attach them inside the bottom of the paper roll first and then added a little glue on the outside to attach at the bottom, so that the leaves comes out a little from the flower. Great ideas for my Sunday school class.